Summary: Want to speed up your iPhone to the best? This passage introduces several powerful cleaning apps for iPhone. Now, you can actually read through the passage and get your wanted iPhone cleaning app! It is no secret that your incredibly iPhone is likely to become slow and sluggish with time. This is mainly because of the accumulation of unwanted junk files in the form of application fragments, cookies, and caches as well as the continuous running of unnecessary apps and processes in the background. All these factors ultimately end up consuming a greater percentage of your iPhone's internal disk storage and RAM memory. Thus, to prevent this from happening, you will need to eliminate such unnecessary temporary files and caches as well as terminate those unwanted background applications and processes. For most people, cleaning files on iPhone is hard than said, so here we have picked up 10 different iPhone cleaning apps for your reference. With it, you will get to learn about some effective optimization and diagnostic tools that you can use free up both your iPhone's internal disk storage and RAM, thus you can significantly boost your device while keeping it at optimum performance. IAssistant is an easy-to-use yet effective iPhone cleaning application developed by "Life On Touch", which can provides you with an easy way to monitor your iPhone's battery usage, system health, CPU, and memory. 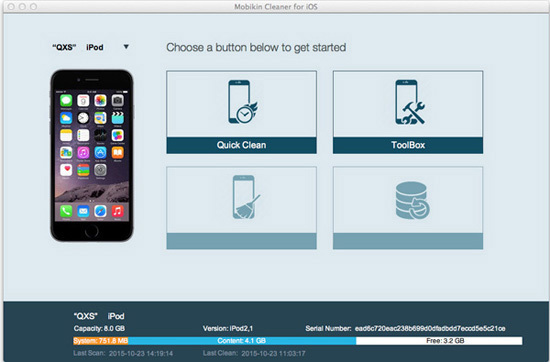 The IAssistant mobile cleaning tool has an attractive interface that is compatible with almost all iOS devices. By using it, you will be able to identify any unnecessary applications or processes that are running in the background, so you can stop or terminate them to optimize both performance and battery. Apart from that, you can also use the reliable information provided by the IAssistant app to identify specific files or apps that are consuming a large percentage of the available disk space to take the best course of action. The Memory 100% PRO tool is a beneficial iPhone app that has been developed by Cocopok specifically to clean, monitor and optimize your iPhone's memory. When your device has enough disk storage space and RAM memory, it is likely to work even much faster than it usually does. Memory 100% PRO provides an easy way to view all of the active processes and applications that are running on your smartphone's system. The effective iPhone optimization tool presents all the relevant iPhone memory information as a attractive multicolored pie chart that is easy to understand and interpret. Bytes is not a free iPhone app here, you have to paid $0.99 to get it on your device. This tool is an amazing iPhone application that has been developed by Recession Apps LLC, which is specially designed to users to actively calculates and displays the amount of RAM (runtime free bytes) on your iPhone device. You can easily use the information provided to calculate and do away with any needless apps and unwanted processes that are running in the background thus boosting your iPhone's performance. One particular thing that makes Bytes stand out is the fact that it presents the running processes and RAM information in an user-friendly manner that anyone can easily understand. SYS Activity Manager Plus is a paid application that can be used to clean the device memory for improving the iPhone's running speed. It easily shows you which apps and processes are running in the background while providing you with an easier way to close them. SYS Activity Manager also has effective tools that can be used to diagnose network, battery and performance issues thus ensuring that your iPhone device works flawlessly. Regular use of this application is guaranteed to help you extend your iPhone's battery life, speed up your smartphone and improve both your phone network and WiFi connectivity speed. The complete system monitoring tool provides you with various effective tools that you can use to optimize your iPhone. The Memory Status is a beneficial cleaning app that was developed by "Kanako Homma" provides you with an effective way to monitor your iPhone's RAM memory. This effective tool provides three distinct features that can be used to clean and optimize your iPhone device. The first is the "Memory" feature from which you can easily get to see which tasks and applications are using your phone's memory while the second is the "Processes" feature. The third and last feature is the "Cleaning" option which can be used to clean the available device memory thus boosting your device significantly. All the three features can be easily accessed and used through the single tap option provided. Memory & Disk Scanner Pro is an unique mobile app that has been designed to automatically clean up your iPhone. It actively scans for and automatically deletes any available junk files, so it can free up your iPhone's memory while keeping it at optimum performance. Unlike other mobile cleaning tools discussed in this article, no manual operation is required when using the Memory & Disk Scanner Pro app. Memory Doctor is an effective cleaning and optimization tool that allow you to display and manage your iPhone's internal memory effectively. The app actively shows all the running processes and apps as well as the available dynamic, inactive and free device memory. You can use information which is provided by the app to carry out various optimizations on your device. The DR. Storage Pro is considered to be the leading worldwide cache cleaner tool. Cache files can be easily defined as containers in which the data provided by your phone's applications and processes are stored. The essential tool that makes it a lot easier to manage device storage provides you with an easy way to identify various junk files that are hiding on your iPhone so that you can delete them. DR. Storage Pro frees up most of your iPhone's internal storage, optimize and boost your iPhone to make it run as new. How to Erase iPhone History?